In my next life I’m coming back as The Favourite Parent. In our house my Husband is The Favourite Parent. Take this afternoon for an example. I decided it was a great time to bake some cookies for the week for school snacks, so the kids each got their dough and we were doing the shapes. And they were all singing twinkle twinkle little star like good little Von Trapps. Etienne helped as usual, but then wanted to go off and water the garden. And what do my ungrateful children do? They run after their Dad. All 3 of them. And leave me eating cookie dough. They left me feeling like The Least Favourite Parent. Which is completely ridiculous, but hey. I know I shouldn’t complain. And this isn’t really complaining. I always admire the easy way he has with them, they really worship him. And then I was tidying up the kitchen whilst Dad was bathing the children and I hear Isabel asking for Mom to wash her hair, not Dad. Well, let me tell you, I skipped down the passage so fast I almost forgot about the damn cookies in the oven. A little win! At last! A great week to all of you, hope you also have some moments of being The Favourite Something. ps Just so you know, the party theme for the day is Lion King 3. Dear friends of ours are out from Ireland and they took us out to a lovely, lovely supper last night. Those of you that have kids will know that there’s some juggling of schedules and arrangement of babysitters required to have a simple night out. Up to now Etienne and I have had the odd date-night where we quietly slip out the door at 8pm when the kids are meant to be settling in for the night, but only after the whole dinner and bath routine is done. Because with 3 of them you can’t just have a single person taking care of them, you need a couple of pairs of hands at the best of times. Not that they are difficult or anything, I mean our children are after all the most beautiful and clever and well behaved children EVER. They just talk so very very very much. Non-stop. But I digress. Last nights’ arrangement was early pre-dinner drinks at their swanky CBD apartment followed be supper at Societi Bistro which meant we had to leave by 5pm. I felt a little guilty and very thrilled at the same time to be missing out on the whole night-time routine, but it was so worth it. I did catch myself trying not to have TOO good a time – how weird is that? Why am I telling you all this? Well, we have tickets to the U2 concert on 18 February and are considering staying over in town and gaspshockhorror it would be the first night we would ever spend away from all our children in almost 3 years. 2. Get our FABULOUS babysitter to stay over with the children in our house. She is also a teacher at their school, so they know her very well and are all completely in love with her. She would be more than capable to take care of them. We really need a night away from our children, much as we love them. We need to have a lie-in lazy morning with no-one jumping on us at 6h30. Not that we’d be able to sleep late, we’d probably be ready to leave at 7am we’d miss them so much, but hey. ps: Go and have a meal at Societi Bistro, they are lovely and the food was great. Our waitress even helped us find our friend’s wedding ring that flew off his finger, out the window and into the bushes outside. Hilarious! ppps: No, I’m not handing out the number of our babysitter. She’s MINE. I was all set to do a really whiny post today about money and jobs and PMS and the like. And then, on the way to school this morning the kids were singing the JanuaryFebruaryMarch song in the car after another extended conversation about having a Barbie Mariposa birthday party (Mignon). My children keep me sane and honest. They remind me that I have an incredibly important job to do. And they make me laugh. Every single day. Sometimes very reluctantly, but still. I try very hard not to judge people that choose not to ever have children because their careers are too important, I try to be accepting and all ethereal about it. And as much they drive me nuts and some mornings by the time we get to school I want to make a handbrake turn and fling them out the door from the moving car whilst cackling like a madwoman and racing away in a cloud of dust I don’t. Because these little people are completely and utterly awesome and Someone blessed us with them. We are the luckiest, luckiest people to have them. I know we are only just a month into the year, but I’m already suffering from a little party-fatigue, so I sent Etienne off to a party with Daniel on Saturday. I also feel like I don’t get to spend any time with Mignon and Isabel, just us girls. So, I had a big plans. First a little R&R quiet time on the couch with Barbie Mermaidia as we needed some quiet time before going out for supper. Then we were going to paint toe nails. And then we were going to decorate Marie biscuits. And all of this was going to happen whilst humming something wholesome. They then ran off, I find them giggling in the sandpit, playing their own little twinnie-game. I started trying to pry them away and realised that they were actually just happy being together, playing by themselves. So I sat watching them from a distance and marveled at how they can play and play and play. They didn’t even want juice and cookies! I’m going to send Etienne to more parties, I can see why he doesn’t mind staying home with the girls, they’re a breeze! ps: As I opened my eyes this morning, there Daniel was, telling me he’d like a Rapunzel party. My children spend A LOT of time discussing party themes. It ranges from Princess and the Frog parties to Scooby Doo parties. We just nod and smile. And I pretend to not internally wring my hands in the sheer terror of not living up to their expectations. Is it just me? Edit to add: Just re-read this. Please don’t think the girls don’t fight and I live a hipster life. It’s all sand and muck in reality and no time for being smug. Just so you know. Are you normal? I mean, as in do you think you are normal? Yes, I know, we all have issues and hangups, but generally speaking we probably regard ourselves as pretty normal and well-balanced people with a fair grip on reality. I sometimes wonder about the things that might be blatantly obvious to other people that I miss. Recently someone made quite a nasty comment in front of other people relating to my fondness for tweeting and making a direct correlation to my parenting skills. I was a little gobsmacked and made my displeasure known after I had recovered, but it really stung. I also have a friend who knows a family that refuses to acknowledge that their child probably has some serious issues (jeez, is that vague enough for you?) and we probably all know a family like that. And when it directly impacts on your own child and a rather scary way how would you get the message across to those parents? My question is this: at what point do you say something to that parent? Those of you that know me know that I am of the bull-in-a-china-shop variety (and I always regret it afterwards). I made a comment to a friend recently and she took it to heart and is thankfully still speaking to me. But what would have happened if she chose to ignore me? Which brings me back to normal. I think my family is pretty normal, but what if we’re completely insane (read: me) and everyone’s just too damn petrified of us to say anything? Maybe we’re just quirky. I read somewhere recently that you shouldn’t leave old age to be eccentric, so I’m going to embrace that and be normal but quirky and slightly eccentric! This sentence came out of Daniel’s mouth tonight. And I promptly corrected him: ‘Ek drink net gou my juice klaar’ At which Etienne corrected me of course: juice – sap. And I rolled my eyes. As you do. We send the children to an English school and they speak Afrikaans exclusively at home as it is our home language. In principal it’s a fantastic idea and it certainly worked for me as people often comment that I don’t speak with an Afrikaans accent and I went to an English pre-primary school. How much should we correct him? Should we just muddle along and quietly correct him (which we try not to do too often)? Any parents in the same position that have some suggestions? We have aquaintances that recently moved back to Cape Town. Etienne got a call last week inviting us to their house-warming party. But alas, the Inlaws were coming to babysit and off we went, me with visions of leaving sneaking out after an hour. As we drive up to the house (very late) we see only 2 other cars and it dawns on me: this is not a party, it’s an intimate dinner party. Gulp. And glare at Husband. be able to walk barefoot without stepping on some sharp object or getting stuck to the floor because SOMEONE messed SOMETHING and didn’t TELL anyone. I felt like cackling like a madwoman when I heard half-way through the evening that ‘they’ are preganant, but I kept it in until we got to the car. Just. Luckily the company was great and we all laughed until we cried and our faces and stomachs hurt! 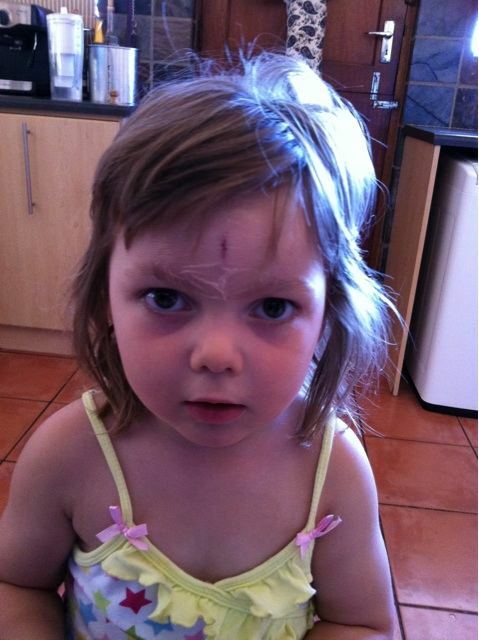 *Isabel was chasing Etienne in the kitchen and ran head-first into the edge of the kitchen cupboard. I must confess I kind of freaked out at the sight of the blood, but my friend Carmen and I took her to the hospital and they glued her back together. She was a real trooper, didn’t cry once! How do you like the title of this post? Confusing enough? Let me clear it all up. One of the things I love most about Montessori is “courtesy and grace”, one of their underlying principles. It’s not just about please and thank you. It’s also about respect for people, animals and the earth. Which might sound a bit lala, but bear with me. As you know we have 3 children. And those children have class mates, Daniel in his class and the girls in theirs. Which, because they are all at the same school, means that there are lots of families with siblings in both classes, 1 child families in either class or families with much older or younger children. All these children have birthdays and most of them have parties. The kids that have siblings in both classes are fine, usually all my children are invited and we all go along. The parties I worry about are the parties where the family has child only either in Daniel or Mignon and Isabel’s class. Before you jump to conclusions, the reason I worry is because I feel bad for that Mom feeling pressurised to invite All My Children, because I want to shout PLEASE don’t invite all of us. Sometimes it’s nice to just go out with one or 2 of them, you get to spend some time with them. Ok maybe not so much, because the really good parties have wine, but anyhoo. And parties are expensive. Here’s the thing though: sometimes the invites are ambiguous and I so hate to ask ‘Excuse me, but how many of my children did you want me to bring?’ Why? If you have known me for a while you’ll know that tact isn’t really one of my (many) strong points (read: I’m far too straightforward for my own good). I battle with gracefully asking difficult questions, I feel too awkward and am petrified of coming across as pushy or rude. So readers, any good advice? And if you are thinking of inviting only 1 or 2 of my children, that’s completely fine, really! 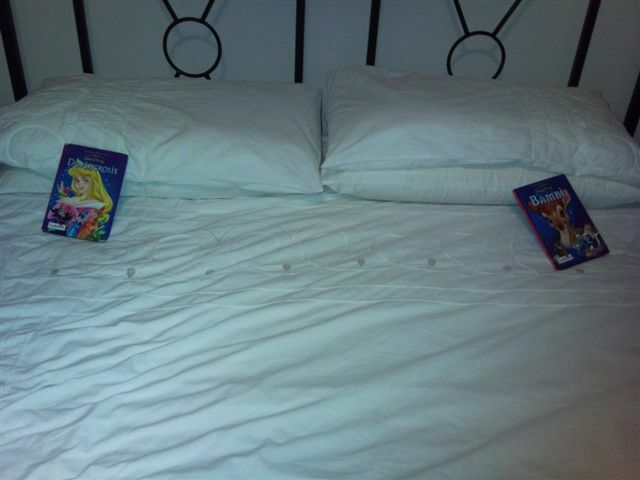 ps Just to prove how lovely my children are, check what Daniel left for us last night for bedtime reading. How sweet is this boy? Yesterday afternoon someone popped in as I was pouring some juice into cups. Daniel and Mignon had pink cups and Isabel a yellow one. There is always a shortage of pink cups in our house. My guest then commented on how cool it is that Daniel drinking out of a pink cup doesn’t phase me. So my mind did one of those ‘whooooooosh’ thingies and I realised that we don’t colour co-ordinate much. If you want the pink cup, great, have the pink cup. And pray that there won’t be an argument about who gets THAT particular pink cup. Same goes for spoons, bowls and food. Yes, food. Daniel has a particular fondness for pink and we could choose if we wanted to fight with him about it “oh look, here’s a blue cup, why don’t you want the blue cup?” Nah. I say, let him have all the pink he wants until he decides he doesn’t want it anymore. And wear his sisters’ crowns, fairy dresses, wings and wands to his heart’s content. I did however wonder about where I should draw the line this morning when I was applying make-up in the car and he also wanted base, powder and lipstick. What do you think? Where do you draw the line between cute and a little weird? I just had an sms from a friend asking how to deal with your little one’s pre-school anxiety and here are my thoughts. I linger at my kids’ school in the mornings partly because I want to make sure that all 3 of them are settled in and happy and partly because there’s such a nice family atmosphere and I enjoy chatting to the Moms and Teachers. It’s HARD to leave your child at a school, whether you’re a Mom or a Dad and often I’ve seen people ask how they will know when they have picked the right school. The simple answer is that the right school is the one where you least mind leaving your children. Really. And trust your gut. If something doesn’t feel right probe and ask until you’re happy, otherwise you’ll spend more mornings crying in your car on the way to work than you absolutely have to. Tell them all about their school, find out the teacher’s name and talk about the teacher before you get to the school (if possible), especially if it is their first time going to school. I did a bit of a test last week when the kids had holiday camp. When I started to leave Isabel was close and I gave her a goodbye kiss and I saw Mignon sitting happily in the sandpit and thought I would avoid drama if I snuck out. I mentioned to the teacher I was leaving and not saying goodbye and we decided to see how that went. Trues Bob, next morning Mignon was very anxious, so I’m never leaving her again without greeting. When the kids started at school I also found that the first day normally went like a party and they couldn’t wait to be rid of me. But they do strike a bit of a wobbly roundabout day 2 or 3 or 4. That’s fine. They are aware that they are being left in an environment that they are not yet familiar with. My advice here is also simple: Distract, distract, distract. Hang around for a couple of minutes, acknowledge their feelings, give them a kiss and a hug and then head for the hills. I have seen new kids that have settled in in a snap and I have seen little ones that have taken weeks to settle. It very much depends on the child. I have also noticed that children that are a little smaller than their peers tend to take a little longer to settle. But if your child is in the right school they will settle down, promise. Don’t underestimate the power of manipulation. They are crafty little buggers, our children. Sometimes I have also seen little ones cry like there’s no tomorrow and the minute Mom leaves to it’s all smiles and happiness. And Mom sobs quietly in her car. Trust your gut. And give it some time, every child is different.